JOIN QUALITY MATTERS! For more in formation please look at our flyer and Resources. If you are interested in participating in 2018-2019 Quality Matters QRIS, please complete the Intent to Participate Form and we will follow up with you. More information about Quality Matters 2017-2018. More than 110 licensed child care programs in Contra Costa County are participating in Quality Matters, our rating and improvement system that supports and incentivizes early learning programs to offer the best care possible. Programs are rated every two years on their level of quality and receive training, coaching, and incentives to raise or maintain their ratings. Family child care, private centers, and publicly funded centers participate. What are programs rated on? Quality Matters builds on our 15-year history of improving early learning quality, particularly for the county’s most vulnerable children. 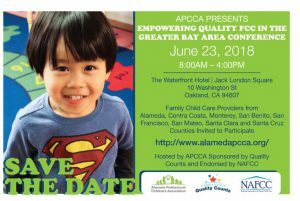 Our partners on Quality Matters include the Contra Costa County Office of Education, the Local Planning & Advisory Council for Early Care and Education (LPC), CocoKids, and Contra Costa, Diablo Valley, and Los Medanos Community Colleges. Upcoming Conference just for Family Child Care Home providers! We support Quality Matters, Contra Costa’s child care quality rating and improvement system.